1. Light a grill. Put the pecans on a sheet of aluminum foil and fold into a small pouch. Place on the grill and toast for 7 minutes, or until they are golden brown. Transfer the pecans to a plate and let cool, then coarsely chop. 2. In a medium bowl, toss the peaches with 1/2 tablespoon of the olive oil and season with salt and pepper. 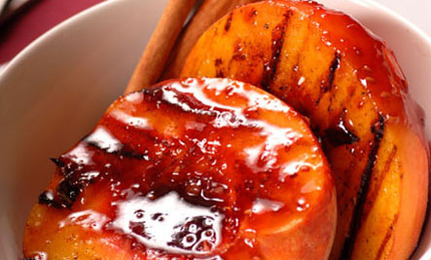 Grill the peaches over a medium-high fire until softened and lightly browned, about 5 minutes per side. Transfer the peaches to a work surface and cut each half in half. 3. In a medium bowl, mix the vinegar with the remaining 2 tablespoons of olive oil and season with salt and pepper. Add the arugula and frisée and toss well. Transfer the salad to a platter and scatter the blue cheese and toasted pecans on top. Arrange the peaches around the salad and serve. Green Advice: Most of these ingredients can be purchased from local organic farms can also provide fruit from the closest possible sources. For more information or to subscribe at the introductory price of $10 a year, go to positivelygreen.com. Positively Green magazine launched in 2008 as a quarterly women’s magazine that covers every aspect of green from eco-friendly vacations to green fashion to green health. With articles that don’t just explain the problems, they outline solutions for busy people who want to make the change but don’t have the time to research solutions. Get daily tips for leading a healthy and compassionate life delivered to your inbox. Please do research on cruelty in goats farms where goats are kept for their milk. As soon as goats stop producting their milk, these animals are killed without mercy and male kids are also killed cruelly. It is all about $$$$$$$$ (profit) knowing without profit, goats farmers cannot make living. People who eat goats cheese and drinking goats milk are same people who are responsible for cruel death of goats and their kids. Make sure the peaches are organic or from local orchards you know aren't sprayed. This fruit is at or near the top of the heaviest pesticide load. That being said the recipe sounds yummy! Thanks. This sounds really good - thanks for sharing. Wow...this all looks so good. Can't wait till summer!